One of the city's grandest and most prestigious apartment buildings, this 12-story limestone palazzo has only one apartment per floor. Designed by Starrett & Van Vleck for Fred T. Ley and Company and erected in 1916, this magnificent and finely detailed building is one of the stateliest, and most expensive, apartment buildings on Fifth Avenue and was the residence of Governor Alfred E. Smith, who enjoyed nightly walks in the Central Park Zoo just across the avenue. Each apartment has a 44-foot-long gallery, five bedrooms, six and a half bathrooms, 7 servants' rooms and five fireplaces and large entertaining areas. The facades are broken into five sections by four prominent stringcourses and the centers of the east and south facades have large balustraded balconies. The Fifth Avenue corner has a rounded column quoin and the building has lush sidewalk landscaping and a very handsome, canopied entrance flanked by bronze lanterns. Because of Central Park views, its small number of units, its palatial apartments, and its location close to midtown and on a quiet sidestreet, this is one of the supreme residential addresses in the world. It has a concierge and a doorman but no garage. The building replaced the Progress Club. 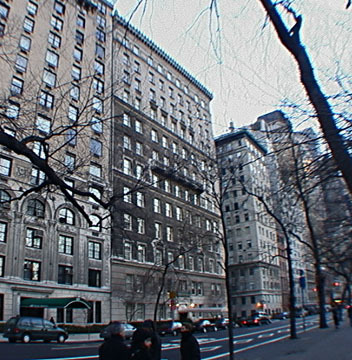 In an article in the April 24, 2008 on-line edition of The New York Observer Max Abelson wrote that Asher B. Edelman told him in an interview about a rumor that he had once been rejected by the building's board that had turned away people such as Steve Wynn and Ron Perelman. 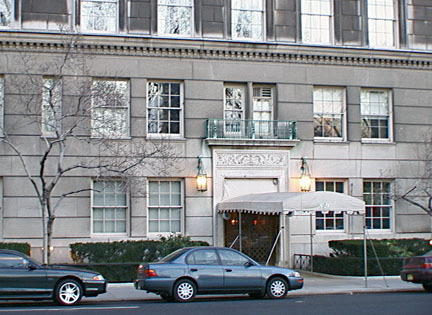 Mr. Abelson's article added that Mr. Edelman "never moved in to 820 Fifth, but he did own Vincent Astors old apartment at 120 East End Avenue, long before he got his current townhouse. Is the former raider sorry that his old 10,000-square-foot Astor apartment wasnt on Park or Fifth Avenue? 'My co-op was 800 times nicer than that,' he said."